Parallettes are great for crossfit workouts, or any workout for that matter, and a great addition to your CrossFit Equipment inventory! You can use them for handstand push ups, push ups, L-sits, and many other workouts. They are pretty simple to build and that is what we are going to build today. 1st let’s get all the materials you are going to need for your parallettes. Do you have everything you need for this crossfit equipment build?? Now as you can see I already have my 10ft. 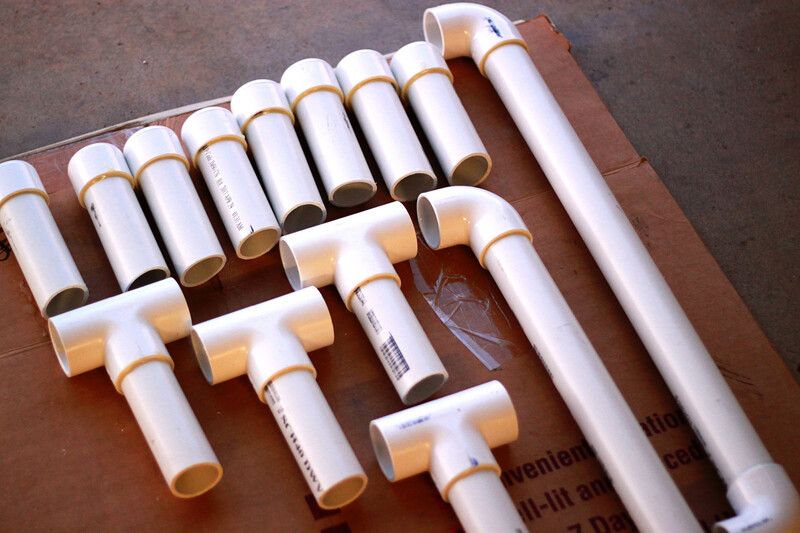 PVC pipe cut down into pieces. The reason being is because I asked the guy at Home Depot if he would cut it for me, and he did! That is half the project right there. Whether you cut it or you get someone to cut it here is what you will need. As you can see that is a lot of cutting. Also the guy didn’t cut mine perfectly straight, but that is not a huge deal in this project. Now that you have everything let’s get to work. Now the guy at Home Depot or Lowes most likely will not clean it off for you. So to make sure everything fits properly you are going to have to take a pencil or piece of sand paper to clean all the edges. After you clean them off they should look nice and ready to go. 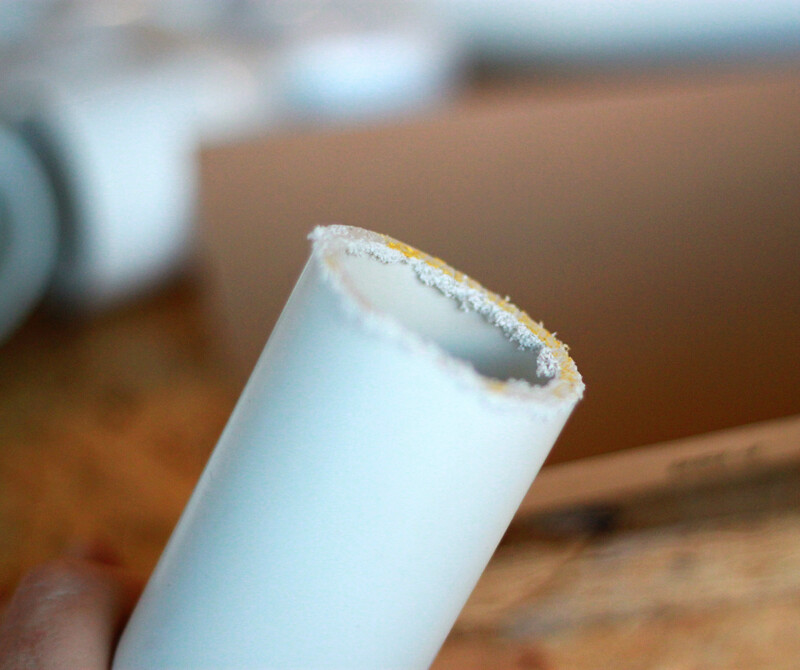 Another optional step is to rough the first inch of all the pvc pipe. It helps the cement stick a little better, but it is not necessary. Everything should be cleaned up and ready for glue now. The next thing we are going to do is build our main horizontal piece. All of this gluing and piecing together is pretty easy. The only thing you need to worry about is making sure you get everything straight. You can use a level if you want. I use the ground and my eye. 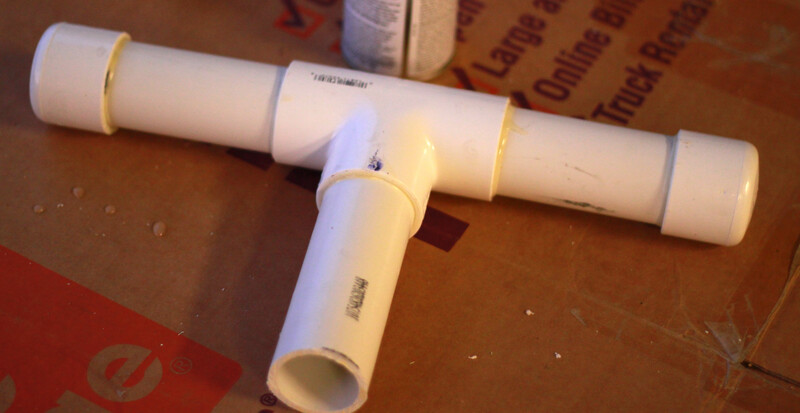 For the main horizontal piece put some glue/cement on the inside of the 90 degree elbow joint and on the outside of the horizontal piece. One side at a time!! Now the pipe in the elbow joint. Once you have both sides lay the piece on the ground and make sure that both elbow joints are even and that it will lay flat on the ground. Don’t wait too long to do this. The cement only gives you a very limited amount of time to actually adjust anything. 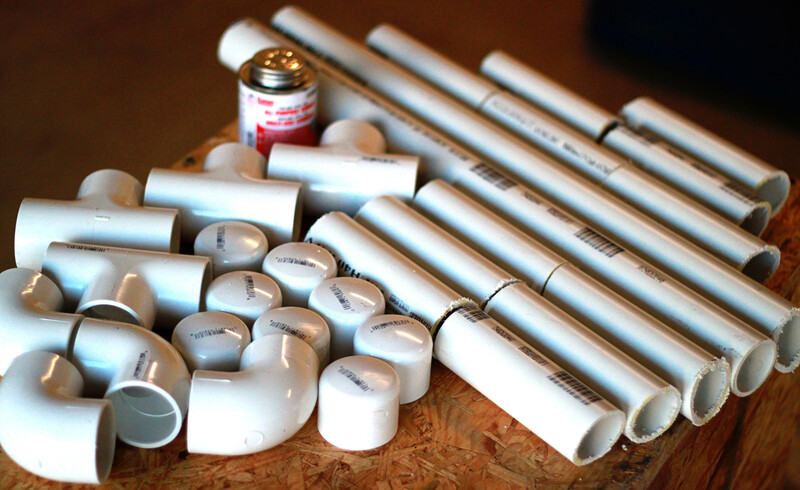 After you get these pieces you can go ahead and start making all the pieces you will need for the rest of the project. Everything to this point has been pretty easy, and it really doesn’t get any harder and complicating a crossfit equipment build is always unnecessary. But if you are the guy who truly loves precision then you are going to want to bust out your level. Like I said earlier, I just eyeball it, but that seems to bother a lot of people. What we are going to do now is take the T joint like in the picture and connect it to your main horizontal piece. If you screw this up you just wasted a lot of time. Nobody wants wobbly or crooked parallettes. Here is what it looked like after I eyeballed it. I just used the ground to make sure it was straight and lined up the 6″ piece with the 24″ piece and made sure they looked right. Do this for all sides (4 total) and you should have your self a nice pair of parallettes. 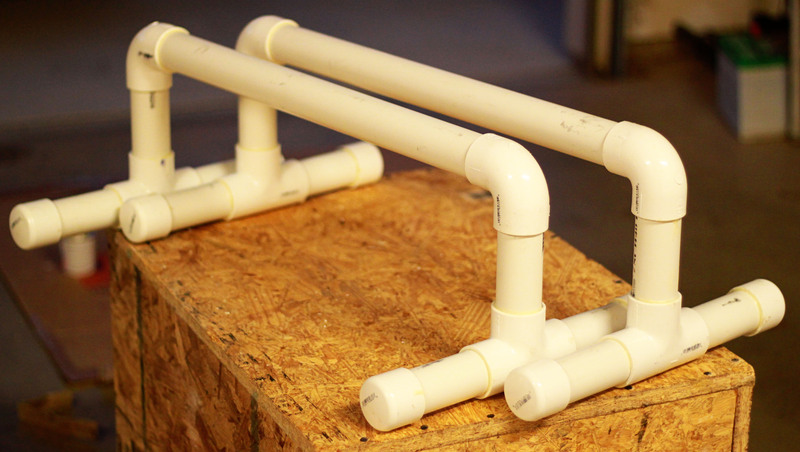 Added Parallettes to your equipment Inventory!! How is your garage gym looking? ?